One of the most common forms of jewellery is the earring, or more commonly referred to as earrings as they are more often than not worn as a pair. Here at ClipOnEarrings.net.au we have an extensive range of clip on earrings in sterling silver, some with gemstones, as well as many in our range of costume jewellery including studs, hoop, drop and chandelier style earrings. The most luxurious earring producing brands in the world are: Harry Winston, Cartier, TIffany and co., Chopard and so soon. A Fresco depicting an elegantly dressed woman with hoop earrings from Akrotiri, Thera (Cyclades) Greece, ca. 1650-1625 BCE. Ear piercing is one of the oldest known forms of body modification, with artistic and written references from cultures around the world dating back to early history. 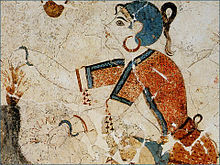 Gold, Silver and Bronze hoop earrings were prevalent in the Minoan Civilization (2000–1600 BCE) and examples can be seen on frescoes on the Aegean island of Santorini, Greece. During the late Minoan and early Mycenaean periods of Bronze Age Greece hoop earrings with conical pendants were fashionable. Early evidence of earrings worn by men can be seen in archeological evidence from Persepolis in ancient Persia. The carved images of soldiers of the Persian Empire, displayed on some of the surviving walls of the palace, show them wearing an earring. Howard Carter writes in his description of Tutankhamun's tomb that the Pharaoh's earlobes were perforated, but no earrings were inside the wrappings, although the tomb contained some. The burial mask's ears were perforated as well, but the holes were covered with golden discs. That implies that at the time, earrings were only worn in Egypt by children, much like in Egypt of Carter's times. In the late 1970s, amateur piercings, sometimes with safety pins or multiple piercings, became popular in the punk rock community. By the 1980s, the trend for male popular music performers to have pierced ears helped establish a fashion trend for men. This was later adopted by many professional athletes. British men started piercing both ears in the 1980s; George Michael of Wham! was a prominent example. The heavily jeweled Mr. T was an early example of an American celebrity wearing earrings in both ears, although this trend did not become popular with mainstream American men until the 1990s. As of 2017, it is very common and acceptable for men to have both ears pierced, and it is widely acceptable for teenage and pre-teen boys to have both ears pierced as well. According to Hindu dharmic tradition, most girls and some boys (especially the "twice born") get their ears pierced as part of a Dharmic rite known as Karnavedha before they are about five years old. Infants may get their ears pierced as early as several days after their birth. Ear piercing is mentioned in the Bible in several contexts. The most familiar refers to a Hebrew slave who was to be freed in the seventh year of servitude but wishes to continue serving his master and refuses to go free: “…his master shall take him before God. He shall be brought to the door or the doorpost, and his master shall pierce his ear with an awl; and he shall then remain his slave for life” (Exodus 21:6). Statement earrings can be defined as "Earrings which invite attention from others by demonstrating bold, original, and unique designs with innovative construction and material combinations". The main characteristic of stud earrings is the appearance of floating on the ear or earlobe without a visible (from the front) point of connection. Studs are invariably constructed on the end of a post, which penetrates straight through the ear or earlobe. The post is held in place by a removable friction back or clutch. A stud earring features a gemstone or other ornament mounted on a narrow post that passes through a piercing in the ear or earlobe, and is held in place by a fixture on the other side. Studs commonly come in the form of solitaire diamonds. Some stud earrings are constructed so that the post is threaded, allowing a screw back to hold the earring in place securely, which is useful in preventing the loss of expensive earrings containing precious stones, or made of precious metals. Hoop earrings are circular or semi-circular in design, and look very similar to a ring. Hoop earrings generally come in the form of a hoop of metal that can be opened to pass through the ear piercing. They are often constructed of metal tubing, with a thin wire attachment penetrating the ear. The hollow tubing is permanently attached to the wire at the front of the ear, and slips into the tube at the back. The entire device is held together by tension between the wire and the tube. Other hoop designs do not complete the circle, but penetrate through the ear in a post, using the same attachment techniques that apply to stud earrings. A variation is the continuous hoop earring. In this design, the earring is constructed of a continuous piece of solid metal, which penetrates through the ear and can be rotated almost 360°. One of the ends is permanently attached to a small piece of metallic tubing or a hollow metallic bead. The other end is inserted into the tubing or bead, and is held in place by tension. One special type of hoop earring is the sleeper earring, a circular wire normally made of gold, with a diameter of approximately one centimeter. Hinged sleepers, which were common in Britain in the 1960s and 1970s, comprise two semi-circular gold wires connected via a tiny hinge at one end, and fastened via a small clasp at the other, to form a continuous hoop whose fastening mechanism is effectively invisible to the naked eye. Because their small size makes them unobtrusive and comfortable, and because they are normally otherwise unadorned, sleepers are so-called because they were intended to be worn at night to keep a pierced ear from closing, and were often the choice for the first set of earrings immediately following the ear piercing in the decades before ear-piercing guns using studs became commonplace, but are often a fashion choice in themselves because of their attractive simplicity and because they subtly call attention to the fact that the ear is pierced. Huggies are a popular style of earring that snugly encircle the earlobe. These can come in different shapes and sizes, from hearts to rectangles. Many custom jewelers make huggy earrings because of the many varieties of setting that can be used to make a good template for their craft. Commonly, stones are channel set in huggy earrings. 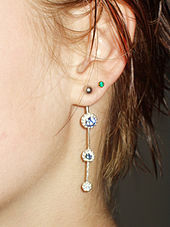 Or Earthreader, Ear String, Threader, a chain that is thin enough to slip into the ear hole, and come back out, dangles. Sometimes, people add beads or other materials onto the chain, so the chain dangles with beads below the ear. A type of plastic stick 1 mm in diameter and 1.5 cm long that goes into the ear piercing. It does not fall out because it is slightly bigger than the piercing. It is quite popular amongst teenage and preteen girls in Hong Kong, as most schools do not allow stud earrings. 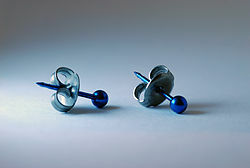 Modern lobe earring screwed onto the lobe. With cartilage piercing, the blunt force of an ear piercing instrument will traumatize the cartilage, and therefore make healing more difficult. Also, because there is substantially less blood flow in ear cartilage than in the earlobe, infection is a much more serious issue. There have been several documented cases of severe infections of the upper ear following piercing with an ear piercing instrument, which required courses of antibiotics to clear up. There are many ways that an infection can occur: the most common way is when the person that got pierced decides to take out the piercing too early. According to the A.M.A,[not in citation given] the proper waiting period to change or take out a piercing with substantially less risk of infection would be three weeks. Researchers observed a correlation between the piercing of young girls' earlobes and subsequent development of allergies. In Professor Ewa Czarnobilska's view (the manager of research team) the main reason of allergy (listed by allergists) is presence of nickel as a component of alloys used in the production of earrings – however the ingredients declared by producer is not significant, because nickel is a standard component of jewellery. Davis, Jeanie. "Piercing? Stick to Earlobe". WebMD. WebMD. Retrieved 5 January 2014. Czarnobilska E.; Oblutowicz K.; Dyga W.; Wsołek-Wnek K.; Śpiewak R. (May 2009). "Contact hypersensitivity and allergic contact dermatitis among school children and teenagers with eczema". Contact Dermatitis. John Wiley & Sons A/S. 60 (5): 264–269. doi:10.1111/j.1600-0536.2009.01537.x. This page was last edited on 6 December 2017, at 02:08. Pitts-Taylor, Victoria (2008). Cultural Encyclopedia of the Body [2 volumes]. [ ]: ABC-CLIO. pp. 94–95. ISBN 9781567206913. The Fayum mummy portraits from Hawara dating from the first to the third centuries CE depict several famales with various styles of earrings. In most cases, the portraits are thought to represent Greek colonists living in Egypt. Some early Greeks wore earrings for the purposes of fashion as well as protection against evil. The popularity of earrings is evident in major cultures of the ancient world. In the middle Minoan period (2000–1600 BCE), gold, silver, and bronze hoop earrings with tapered ends were popular. In the late Minoan and early Mycenaean periods, the hoop evolved with a conical pendant. Latest catalogue shot. "Maithili Kabre handcrafted earrings". Demello, Margo (2007). "Encyclopedia of body adornment". ISBN 978-0-313-33695-9. Sherrow, Victoria (2001). For appearance' sake: the historical encyclopedia of good looks, beauty, and grooming. Greenwood Publishing Group via Google Books. p. 101. Ito, Masami (May 20, 2008). "Ainu: indigenous in every way but not by official fiat". The Japan Times. Retrieved March 4, 2011. "Lual Statement Earrings - What are Statement Earrings?". Lual. Retrieved 2017-07-20. Erica Weir (2001-03-20). "Canadian Medical Association Journal – Navel gazing: a clinical glimpse at body piercing". Cmaj.ca. Retrieved 2012-06-10. Meltzer DI (2005). "Complications of body piercing". Am Fam Physician. 72 (10): 2029–34. PMID 16342832. Thyssen JP, Linneberg A, Menné T, Johansen JD (2007). "The epidemiology of contact allergy in the general population—prevalence and main findings". Contact Dermatitis. 57 (5): 287–99. doi:10.1111/j.1600-0536.2007.01220.x. PMID 17937743. "American Medical Association". Ama-assn.org. Retrieved 2012-06-10. Centers for Disease Control and Prevention. "CDC Fact Sheet: HIV and Its Transmission". Cdc.gov. Archived from the original on 2012-06-07. Retrieved 2012-06-10. Watson D. (Feb 2012). "TORN EARLOBE REPAIR". Liver International. University of California San Diego School of Medicine. 35 (1): 187.